How many times can you look at a photo of these same sidewalks that I run on every day? Yup, here they are again! I must be breaking all the blog rules about keeping my readers interested by variety. And yet, dear friends, you keep coming back! An uncle of mine, who is a pastry artist, once told me that when he was little my grandmother didn’t want to bring a whole box of crayons along when she brought him with her to her appointments, so she just brought one crayon (I wrote about this on my other blog in the post “One Crayon”). He told me he developed his art talent by the fact that he had to make that one crayon look so many different ways. Well, something similar is the case with my barefoot running and this blog. I have to make my one sidewalk look so many different ways and see it from so many different angles because I never go anywhere else. But, being kind of “stuck” here for the time being in my barefoot running life, I have been forced to see that there is so much to learn right on this one little path and that I do not necessarily need to leave for trails along oceans and up mountain tops in order to discover new things about barefoot running. Yesterday I wrote about getting myself out there too late and the pavement was too hot. I told you I would try to go out later in the day. I kind of chickened out going out later in the evening. It was Memorial Day, and I had forgotten that this boulevard is crammed with people strolling along looking at the boats on The River. There would be dogs, and children and crowds of people. Although Barefoot Fresca is brave and doesn’t care if people see her running barefoot, that was a little too much to go out there with her little dog and weave in and out of that scene. So, I decided to go out this morning instead even though I have Kung Fu tonight. I hope I will be able to handle Kung Fu class. I almost made the same mistake and got out there late again, but not quite as late as yesterday. The shadow from the wall had already receded and the tiles were exposed to the sun, as you can see in the photo above. However, it was early enough that the trees along the path were still casting a shadow, which had not been the case yesterday, as yesterday it was past noon and this morning it was enough before noon that there would be some shade from those trees, thus making it possible to run across little hot sections from tree to tree. There was no way to run in the shadow because it was right up against the wall, and besides, even if one could be that close to the wall and run, one wouldn’t want to because that wall is very famous for being the place all the doggies like to relieve themselves. As brave and un-squeamish as I’ve become about sidewalk dirt, I don’t have the inclination to run along that strip. I did find that the section immediately to the left of the shadow that remained was cooler than the section of sidewalk a little to the left of that. I think it is because that strip of pavement has only been newly exposed to the sun and had less time to soak it in and heat up. So, my strategy was to run on that strip. I tested it out several times and it was definitely cooler than the center of the path. The day before, my feet had become slightly burnt by the 1/4 mile of hot pavement I had walked on. Last year I would have given them an entire day off to heal up and toughen. That worked really well. But my feet seem to adjust more quickly this year – definitely a sign of leaving beginner-hood behind – and it felt right to go out this morning. If this run was not part of my black sash training, I would have just waited another day, but I am determined to get two runs in at least this week because I believe it will help my stamina during my black sash test. As you can see, the shady strip along the wall has become very small, and the rest is hot, hot, hot! In a few weeks, that hot section will not be a problem. I know that because last summer it was not. 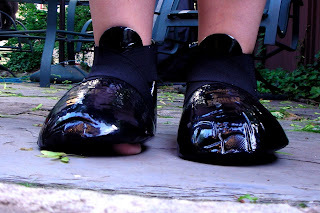 But until I get my thermal resistant soles built up, this is a little tough and needs to be taken a little at a time. I stayed close to the shady part, where the tiles were slightly cooler, but when runners coming from the other direction came, I had to move out to the middle where it was hot. You see, in the hierarchy of runners, the slower, less-experienced runner is the one who has to give way to the “professional” runner. One can feel the hierarchical energy and one knows when one is supposed to yield. I’m not exactly sure of this, but I sense out there that the barefoot runner must yield to the shod runner. 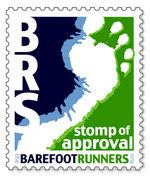 It is a humiliation for the barefoot runner, for the barefoot runner must accept the position of being “lower” than the “serious” shod runner, even though the reality is that this may not be so. Perhaps this is all in my own mind. Perhaps it is just me who always yields, because I think I am truly the smallest and least of all runners. No. They don’t. There is stuff that barefoot runners know about these here sidewalks that all the world does not know!! Secret barefoot knowledge! One last little bit of secret barefoot knowledge about this path to share. You can see in the photo to the left that there are sections of the path that have this decorative stone inlaid (which the dogs also LOVE). When running along the shadow on the cooler part of the tiles, I had to move out when I got to the stones and it was hotter out beside the stones. All in all it was a great run, and I had some thoughts about it being like resistance training and I think I solved the question I’ve been having about whether to increase speed (intensity) or distance (endurance) first as an overweight runner. I was going to share the conclusions with you in this post, but it really doesn’t fit because this post is mostly about handling the hot pavement. So I’ll save my other strategy for another post. Right now my feet feel slightly burnt again, but I know that will be gone within a day and my feet will be more tolerant of the hot sections than they were today. Ouch, ouch, ouch-ouch, ouch, ouch ouch!! I made a mistake today. I waited too long to get out there for my planned barefoot run and the shadow from the wall along my boulevard was not there and the tiles were hot -- very hot! Last year I very methodically and carefully built my mileage up bit by bit. I started running only about 100 yards, then a 1/4 mile, until I could run a barefoot mile. While I was gradually increasing my barefoot distance, gradually toughening the soles of my feet, gradually strengthening the unused muscles and tendons and ligaments and bones, I was also gradually acclimating the soles of my feet to the heat of the sidewalk. I eventually got to the point where it didn't bother me to run on a hot sidewalk, but even so, I planned my runs so that I didn't have the hottest sidewalks and so there would be patches of shade along the way for relief. I also would carry an emergency pair of Vibrams or flip-flops just in case I got stuck out there or something. But this year I've been regularly running about 2 miles out there. There hasn't been a need to build gradually from scratch like I had to last year. Feet have felt great in every other way so I wasn't really thinking there would have to be any kind of re-conditioning for the heat. But I was wrong. We had a kind of cold rainy spring and we just plunged straight into hot summer days this past week. I sort of thought because I had kept my feet somewhat conditioned for the cold that they would be tough enough for the heat too. Lesson for today: Cold conditioning is a separate state than heat conditioning. I got out there and was trying to walk my 1/4 mile to my starting place and I could feel the burn on the bottom of my feet. I considered just going ahead with it anyway. I really didn't want to go back. I wanted to get the run done. I looked across the street to see if it was shadier there. Nope. I could have just ignored common sense and gone ahead and tried running. But deep down inside I knew that it was not a good idea to go ahead and run. Why did I know? Because my feet were telling me. They were sending really strong signals that I'd be in trouble if I went ahead and did it. I actually experienced myself block out the "voice" of my feet as I was considering the options, kind of like a mom might block out her kids' voice when she's thinking something over and not realize the kid has a good point. But suddenly the principle of listening to my body came back to me and what my feet were saying came into clearer focus. No, don't do it. So, I made a decision to turn around and come back. I will go out later when there is some shade. Kung Fu Black Sash Test in Two Weeks! This is it folks. The final two weeks before the black sash test. You know the story. Started training in January. Intense, brutal early Saturday morning military-style workouts. Almost fainting one day. Lips turning blue another. Didn't train as planned. Kids in the class using me as a punching bag during the sparring time (ouch!). Final decision to go through with it amidst doubts. And this morning we didn't have Kung Fu class because the school was closed for the holiday. So I had to do something very opposed to my nature. I had to give myself the whole gruesome workout at home by myself. Because there is no way I'll make it if I don't keep it up during the time off. I am really really proud of myself for putting myself through that workout all by myself this morning. Was rewarded with a flood of great endorphins afterwards. Something I noticed. The jumping jacks were "easier" when I did them by myself. Less fatiguing. Could it be because I did them barefoot? 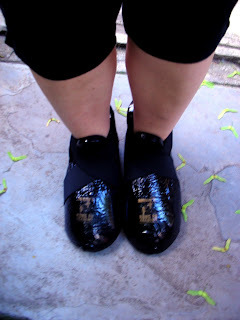 Remember the post where I agonized over what shoes to wear for the black sash training? After all that guess what I did? Nothing. I just went ahead and wore the beat-up pair of running shoes the whole time. I guess I was just tired and didn't want to go through the whole hoo-ha of finding out whatever shoes I chose didn't work any better. All Kung Fu practice sessions at home have been done barefoot and I've been loving it. My feet have not been liking that old pair of running shoes that I stuff them into for Kung Fu class. The bump in the shoe has irked me and thrown me off balance. My feet cramp up in them when I'm doing the crunches, like I'm getting charlie horses in my feet! Every time I have them on I think, "I've got to do something about this," but then I don't. At a certain point in the black sash class, we have to get our sparring gear on. We have to get into this protective get-up in 3 minutes (which I haven't fully mastered yet). You don't pass the test if you can't do it. This is great! I am wondering if I would be permitted to take the black sash test barefoot? I feel that it would be way better if I could. I would have way more fun going through that two-hour highly intense test if I didn't have to do it on a bump in my shoe. Maybe I will ask. Right now my barefoot running is an adjunct to this Kung Fu training. I've been going out and running roughly two barefoot miles on the days I don't train the Kung Fu. As soon as this black sash test is over with, I plan to start running further distance. These next two weeks are crucial if I'm going to pull this off. every day -- go through Long Fist I and Long Fist II very slowly and thoroughly twice each and one time fast each. I CANNOT MISS CLASS, because if I do I will have to do the workout on my own and I HATE THAT!! There is still a chance I might chicken out of this. I'm going to see how it is next Saturday morning and if it feels like it's going good, then I'm going through with it. No days off from here on in. I have so much more to write about. Next couple of posts will be one on the subject of "Pain" and the other on "Warming Up!" How can I explain what's been happening ever since I told you last January that I had been invited to black sash training? I know, I'll compare it to training for a marathon. Did you ever have one of those times when you signed up for a marathon and planned to train, but then things did not proceed as smoothly as you had wished, and you found yourself lagging in your training as the marathon approached? That's kind of how the black sash training is going. Last fall, I joined a second choir and was all into my barefoot running and blogging about it. Due to the difficulty of juggling these new time commitments, I had kind of lapsed in my kung fu training during November and December and became de-conditioned for that. I really did not expect to be asked into black sash training and when I was I knew that it was going to be hard coming off of two months neglect of my kung fu. It was true that the first class was brutal, but I expected that if I kept up my running, and did not miss any of the regular kung fu classes during the week I would be fine. The first few weeks went pretty well. Each Saturday morning we would wake bright and early and head over to the kung fu school to start by 7:45 and each Saturday morning -- actually the stomach ache would start Friday night -- I had a huge stomach ache on the way over thinking of how intense the class was. You all know that I don't like working at high intensity levels. You've followed along at my slow pace ever since I started this blog. "Slow and steady wins the race" is definitely my philosophy and I also believe that you can coax yourself into fitness just as well as drive yourself into it. So, to be in this almost military-style, boot-camp-type training was a pretty drastic change for me. I'm still not completely convinced this is the way it absolutely has to be done. It still believe there is a kinder, gentler way to fitness goals -- (as a matter of fact, check out this little article by two-time Hawaiin Ironman World Champ Chris McCormack which seems to support that idea a little bit) -- but I'm going with it because it's my school and my classmates and we're all in it together and this is the way it's done at the school. Although the first few weeks went well and I was progressing and it was feeling a little less painful (sort of), I ran into some snags. All of a sudden there were multiple events at the school to go to on kung fu class night and other reasons why I could not make it to class. Well, that's okay, I'll just work out on my own. But it was much harder to force myself through the workouts by myself, without the group. It is much easier for me to pick up and go for a run than to put myself through that circuit training of multiple non-stop sets of jumping jacks, pushups and crunches. During one of the last black sash class while I was sparring one of kids gasped, "Mrs. Barefoot Fresca, your lips are purple!" What?!? Uhh... [panicked] Is that bad? "It means you don't have any oxygen!" After that class I knew I had to get serious. It wasn't too late yet. Six weeks left to the black sash test. If I got myself on a committed and consistent little program I could still do it. Two weeks passed and I still hadn't started on my serious committed program. I decided that I will get serious and I will do it. I made a four-week plan that I believe if I stick to it will accomplish the goal. I won't come in first place, or make any kind of impressive showing, but I will at least be able to pass. It's not too late. It gets way too warm in the house -- and still way to early to put A/C on -- so I went outside in the yard to work out. Oh, no, there were little neighbor boys playing in the yard behind us! Well, the thought of doing it inside was too stifling, so I'll just go ahead with it. I managed to do my conditioning exercises behind the table with the umbrella and they didn't seem to notice. Even though I probably didn't need it, I rolled my purple yoga mat out so when I dropped down for pushups I would be kneeling on something soft. But when it was time to practice forms, there was no place to hide. In order to have the space I would need, I would have to go out there in full view of the boys. As I began Long Fist I, I heard the voices. "She looks like a Ninja!" "Hey, guys, she's doing Kung Fu!" At a certain point, I couldn't pretend not to hear the voices any more. I stopped and looked over and saw four boys hanging over the back fence watching me. "What are you doing?" they asked. I told them I was practicing for a test in Kung Fu. This is funny, right? This barefoot mom practicing Kung Fu in her backyard with four little boys hanging over the back fence watching her? In the last post I told you that I've found a warm-up to use for all my physical endeavors and that I'd write a post about it. Here it is. "What?" you ask! "What is extraordinary about this warm-up? It is very simple, kind of mundane and routine, and nothing that doesn't make sense or that one couldn't devise for one's self." In fact, in Episode 1 of this same series of videos (the one posted above is the first video in Episode 2), the video creator, Paul Zaichik, himself admits that this routine is simple and does not have the "wow" factor one might be looking for. But I think there is something special about this routine. For some people -- and most especially for a person like me -- a routine like this is exactly where they should start when they want to get back into movement after having gotten horribly out of condition and after bones, ligaments, joints, muscles have become stiffer, weaker, smaller and creakier through years of inactivity and disuse. The movements that Paul Zaichik goes through in these videos are the A-B-Cs of movement. Every skill, every physical endeavor has it's basics -- the fundamentals. Many times in a craze and frenzy to become fit, lean and sleek -- in an eager desire to have athletic accomplishments -- people rush through the basics to get to the "good stuff." The basics are boring, and seem unspectacular. Yet the basics form the foundation for everything else and if there is a weak link there, injuries are ready and waiting to happen. Recognizing the shapes and knowing the sounds all the alphabet letters make leads one to being able to make and recognize words, which then later leads to forming sentences and paragraphs, and much later to complicated written and spoken communication that eventually expresses complex and abstract concepts. What we have here in this video is the alphabet of human movement: joint rotation, flexing, extending, bending, rotating, stretching, etc... Getting familiar and bringing one's self through this simple progression of movements is like a recitation of that alphabet that will set a person up for physical activity above and beyond. It will reveal weak and troubled spots, and at the same time strengthen and correct problems. They are functional movements that will be used in more complex situations later on. I admire the patience of Paul Zaichik. If you check out some of his other videos, he has a vast knowledge of how movement works, especially in the martial arts, and he himself is a master of movement, skill, power, speed. And yet he is humble enough to sit down and patiently go through a basic movement routine to teach someone how it's done. That's like a great literary academic sitting down to patiently teach kindergartners their ABCs. There is something really humble and special about that. Using this routine would be a great starting place to lead a person into more advanced physical and athletic pursuits. I got myself involved in more advanced tasks of movement before getting myself through these basic levels of development, but it is not too late to go back and work with the A-B-Cs. Because I love some of the more advanced stuff I'm doing, I'm not going to go completely backward by giving it all up and starting with only this routine to build from the ground up. But I think it makes a great warm-up and adjunct to the other stuff I'm doing, and I have already experienced how much better my other workouts feel after going through this fundamental routine. By the way, if you want to hear his in depth explanation for all the movements in the routine, you can watch through all the Episode 1 videos on the Project Elastic Steel channel. I did, and found them very informative. Also, this guy Paul Zaichik is very capable of also producing the wow factor, so check out some of his other videos on the more advanced stuff if you're looking to be impressed in a more conventional way. What a gorgeous day it was for a barefoot run! The joy of barefoot running truly returns with the spring. Even though it was possible to tough it out in the colder snowy weather, there is no doubt that the full joy of it blooms in the spring. Had planned not to give play-by-play descriptions this season, as I did last year, but so much happens out there, it's hard not to come back and talk about it. One excitement is that cobblestone sidewalks and asphalt do not feel rough and hurt-y this season! The feet are definitely reverting to a state once known in childhood, when they walked over all the hurt-y things all summer and didn't seem to notice. Don't know why, exactly, but there's a kind of elation in this. Today at the finish of my run, a guy rode up to me on a bicycle. "You should buy those new shoes," he said, definitely with the tone as if he thought he was telling me about something really cool that I would like. "I've got 'em," I said (not smugly). "You mean the Vibram Five Fingers, right?" "Yeah," he said, and then he rode his bike back in the direction he had come from. I got the distinct feeling he made the trip just to tell me that. DOES HE NOT KNOW WHO I AM? I ... I AM BAREFOOT FRESCA! OF COURSE I KNOW ABOUT VIBRAMS. I WRITE A BLOG. I READ BOOKS. I TAKE PICTURES OF MY FEET. I ... I ... I KNOW ABOUT EVERYTHING!!! "I have started a barefoot blog even though the only knowledge I have of barefoot running is what I have read and exists as an appealing theory to me." "I have started a barefoot blog even though I am an absolute beginner who has only run barefoot about six times." "I have started a barefoot blog even though I have no idea if I'm going to stick with barefoot running or not?" Barefoot Fresca: "Beginning the Barefoot Journey"
In my next post I'm going to tell you about some warm-up exercises I've been using before I go for a run. I was going to tell you about them in this post, but I realized there was a lot I wanted to say about it (don't worry -- not too much), so it would warrant it's own separate topic. I also took some videos of me practicing Kung Fu barefoot outside. I'm not sure about showing you the practice videos because I'm not that good. But they are of interest because it's being done barefoot, so perhaps I will show them to you. The first part, where I just lift my leg -- called "chambering," I think -- is something that I need to do over and over again because a while back I couldn't do that part without falling over. What good is going on to try to kick something if you can't even get that part right? So, some of my Kung Fu practice is very un-glamorously repeating that motion over and over again. I had worried about pivoting while barefoot, but that doesn't seem to be a problem here, does it? In fact, doing it barefoot has been as great as discovering barefoot running was. If you liked these videos I can show more. As you can see, it may sound impressive that I'm going through black sash training right now, but I have a long way to go to master this stuff. In fact, I'm not sure exactly why I was invited into the training, but we'll just go with it. 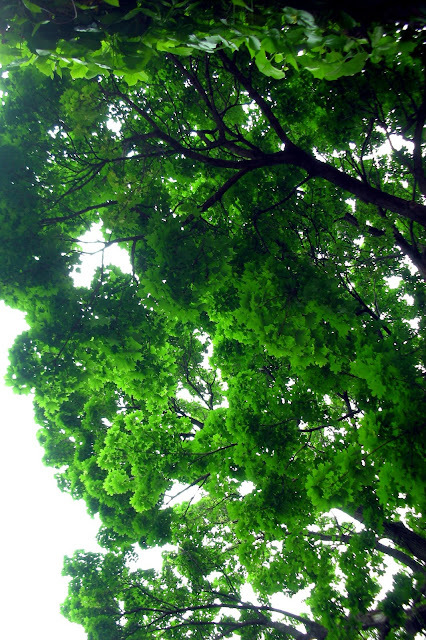 Let's say you are like me, and you allowed yourself to live a sedentary life for many years. Let's say you are like me and you had once known what it was like to experience activity and a modest amount of fitness, so you knew what you were missing. Let's say you were like me and you always had the secret dream of becoming a moving, flexible, strong, graceful person again. Let's say you were like me and after putting off this "secret dream" for many years finally realized that you'd better do it. So, you lifted yourself up off your couch and started to become physically active again. Maybe some of you jumped right up and got right into it and after a few months of adjustment were back in the swing of things. But maybe others of you, for one reason or another, found that it was not as simple as it seemed to transform one's body from a sitting and thinking machine into a moving and doing machine. The fact is that it takes time and patience to put it all together. There will be ups and downs and injuries and setbacks. There will be periods of progress that seem to go down the drain because of one interruption or another. There will be over-eagerness and lack of realistic goals that precipitates too-much-too-soon burnout. There will be a laziness and lack of motivation and drive that hold one back because one doesn't demand enough of one's self. There will be lack of foresight and an intelligent approach. There will be an approach that is too thought out and too detailed and too intelligent that is impossible to achieve. All kinds of things to go through. You may find that the freedom of movement you admire when you watch the top athletes on TV does not come easily. That movement and athleticism is multidimensional and that there are way too many body parts,systems, interactions and functions involved. You start an activity and then you find out that there are limitations that are preventing the fullest expression of that activity. You find out that you might need to improve your strength in other areas that don't even seem related to the activity you've chosen. You might find out that some of your joints and ligaments need to open up and rotate and move in ways that they could not when you started. You might find that your muscles are tight and need some kind of stretch or myofascial release. You might find that your muscles are too weak and you need to supplement with strength training. You might find that moving in only one direction and one way all the time makes you kind of a lopsidedly fit person. You might find that it's hard to carve out the time, and that every time you try to add a new activity, everything else has to be rearranged. You might find that you have to give up other stuff you really enjoyed. You might find that it takes a long time, lots of trial and error. You might find that missing just one piece of the puzzle may cause trouble and/or injury and prevent you from progressing. At some point you might realize that this is going to be a lifetime endeavor. All this sounds much more complicated than just going out for a little jog every night, doesn't it? The fact of the matter is that merely getting off the couch and going out for a little 20 minute jog every day is going to improve a person's life. That's fine and good, and maybe an old fat lady like me should be content with an improvement like that. But the way I'm wired, I find out that isn't what I'm really after. Think what I'm after is the ideal of freedom. To break free of the limitations that hold this poor body back. Maybe what I'd really like to do is learn how to fly. It just seems like if I could get all the pieces in to place, wave my arms in just the right way, with enough flexibility and strength, just the right amount of training, and catch the air current just right, maybe I could fly. To have a dream of moving like that -- flying free -- when one is so earthbound and is aging fast, can seem the height of ridiculousness right? Overweight -- not just by a little, but a lot -- Aging -- turning 50 this summer -- Osteoarthritic -- after she's been sitting for a while she hobbles across the floor in a bent over position until her joints get all oiled up and working again -- Lethargic, Slow to move, Prone to Procrastinate ... And she thinks she's going to fly? But it seems like running might be a way to experience a moment of flight, because, unlike walking, there is a moment when both feet are off the ground, and you are kind of flying.